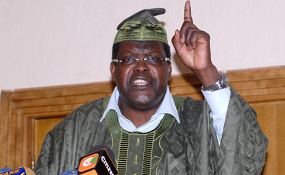 Deported lawyer Miguna Miguna was on Thursday caught up in a classic Twitter faux pas moment when he mixed up details of ODM leader Raila Odinga's political career. Raila Odinga's first stab at the presidency was in 1997 on a National Development Party ticket. It was Jaramogi Oginga Odinga who ran in 1992. Perhaps you've been away too long @MigunaMiguna? Miguna thereafter realised his mistake but an apology wasn't forthcoming. I know, chief. That was not the SUBSTANCE of my statement - and you know it. The 5-year window changes nothing regarding the point I have made. That is a minor thing that does not change the SUNSTANCE of my point. In 1997, @EmmanuelMacron was only 20 - if that makes you happy, ndugu. That's what the English call "splitting hairs." It makes no difference - SUBSTANTIVELY.